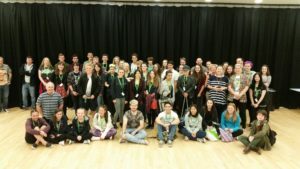 Director James Williams was placed, alongside the producers at Arts Active Wales, with the admirable but ultimately unenviable task of threading together a week’s worth of workshops, carried out by young people who had never before met, together into a show worthy of the New Theatre. Despite the insularity that is always a potential threat to any of these types of projects, they always expand outside their form – making it a real shame this performance, perhaps weighed down by the somewhat awkward virtue of its name, wasn’t a tad more well marketed. What the Sherman NT Connections festival did so well with interpreting set theatre pieces this project did for new material. There were, of course, lots of layers of interweaving. The more complex ideas with the weaker ones, the reasonably large age gap of performers aged 14 – 25, and of course the disciplines of circus, design, dance, art, music and the spoken word. The poetry, overseen by Literature Wales was one of the highlights, although a few themes might’ve meandered, and there were moments where politics seemed a little indelicately transposed onto some performers. Having sat in on the workshop, any chinks in the material were minute distractions against the obvious double edged sword of the time frame, and the integration of every workshopped piece into the whole. 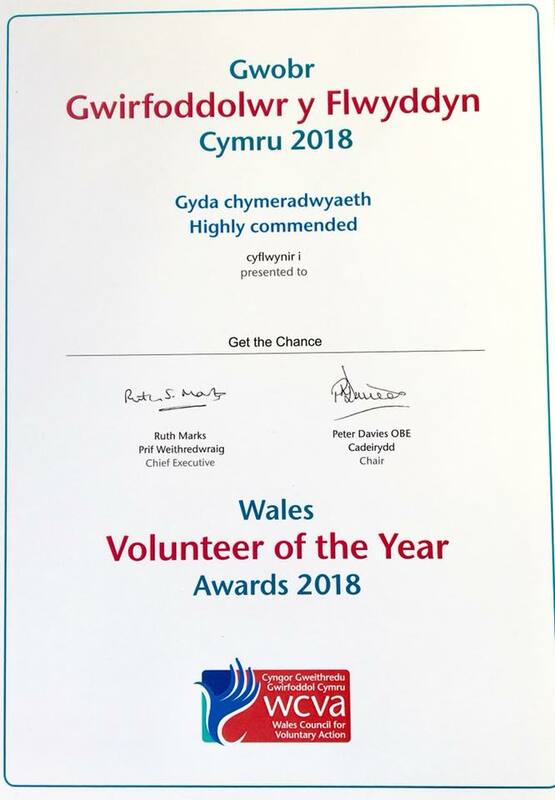 Community Music Wales where also very active in the show but where better executed and more memorable when used as a backbone for the other artforms. The Art and Design elements were the most sporadically used but well done; a Dali like background to an intense, exhaustive dance piece the most effective example. Impressive puppetry was also used, although the flashy teddy bear, turned Gothic by the lighting, would best be appreciated of those who, unlike this critic, have not been subjected to the ‘wonders’ of FNAF by younger family. No Fit State’s Circus performances showed the two most obvious flavours, a humorous but slight juggling gag to trapeze, but there will be no world in which the mastery of the latter doesn’t inspire some kind of awe. All the elements worked well together, but Earthfall Dance had a monopoly on the night. Contemporary dance is one of those things all too easy to get wrong, viewed by the general public with cynicism, and even sometimes within the arts with a gentle wryness. In this show, it was stunning, performed by the trained dancers, with natural acting talent alongside passionate energy. It whipped up the most natural commentary and narrative of the night whilst seeming absolutely effortless. As always, simplicity was king and queen alike. Even though others without dance experience were involved, they too seemed totally natural. Whether swift and pulsating or tender and subdued, it was perfectly executed. Overall, the pieces which were meant to form more of a cohesive story than a thematic connection were too brilliant not to hinder the more standalone pieces which would otherwise be fine if unengaging but it rather accurately depicted the current arts scene, whilst showing plenty of scope for new forms of talent. The difficulty in reviewing this was that any flaws are part of its form and therefore, any commentary can’t seem too constructive, but trying to bring young talent out of its usual spheres and into the general stage is an admirable thing. It was never going to be perfect or show any calculated insight, but it was certainly vibrant and showed plenty of the organic kind. Very much worth keeping an eye out for next year, but keeping it in context is essential for the ride. 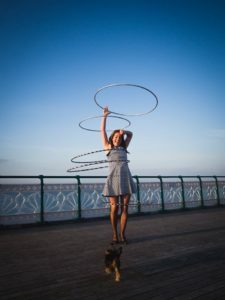 Our project coordinator recently spoke to Ellie Kate Edwards about her background in Circus and her plans for a new Circus School and festival events in Penarth. Hi Ellie you have a background in training with Circomedia and No Fit State Circus. Is it possible to give our readers some background information on yourself? Yes, I am from a little village In Caerphilly. I spent most of my childhood around horses and adventuring in the mountains. I loved dance and music. I was inspired by circus when I saw NoFit State’s ‘Immortal’ in Barry. It was the start of my obsession with circus. At the time I was studying social work and left the course to follow my passion. I started training in the South of Spain with a beautiful travelling community. They had an aerial rig in the most idyllic setting. I would train all day long getting blinded by the sun . I used to love looking at the sky line of the mountains while I was upside down. It was there that I decided to follow circus as a career and returned to study in Bristol. Absolutely, it’s an incredibly demanding and competitive career. I sometimes I think it must be very nice to have a fixed contract, paid holidays and some security in your work. Having said that I love circus and I would feel totally at a loss without it. I have put countless hours into my passion and when you put so much love and work into something it becomes part of you. I wouldn’t want to change that. Are there any individuals or organisations that helped support you once you realised a career in circus was for you? I have had a huge support from Nofit State all the way through my career. From helping with audition pieces, a traineeship and guidance with new circus ventures. There has always been someone from NoFit State with the right bit of support at exactly the right moment. Awareness of circus as an art form is growing, organisations like No Fit State are leading the way in circus across the world. In your opinion what is need to help the art form develop? Circus is at a very exciting time in its development, It will be very interesting to see which directions it will take. When we train in circus schools we are allowed a period of time where we can be very creative and inquisitive with circus as a new art form, we can develop our skills as individuals find the material which is unique to each circus performer within their discipline and so prevent ever trapeze artist from performing the same routine. Once we leave circus schools we very quickly learn that the opportunity for this creative exploration is limited and to make a career in circus we very quickly have to produce the work which is in demand. If we could access funding we could return to this with time to collaborations with other circus performers and artists from different art forms. We could again explore the opportunities to make circus political and find the possibilities for progression. There are a lot of possibilities and avenues to be explored still but circus performers and directors need to time and resources to research. I have recently started to put on circus events in my local area. I am finding that there are many venues who want to have circus shows in there venue as it reaches a large and diverse audience. The problem is it costs a lot of money to bring circus shows to venues and so it can only happen if the venue, company or a combination are prepared to take big financial risks. Opportunities to find match funding or funding to help venues set us as a circus venue could help this to happen. 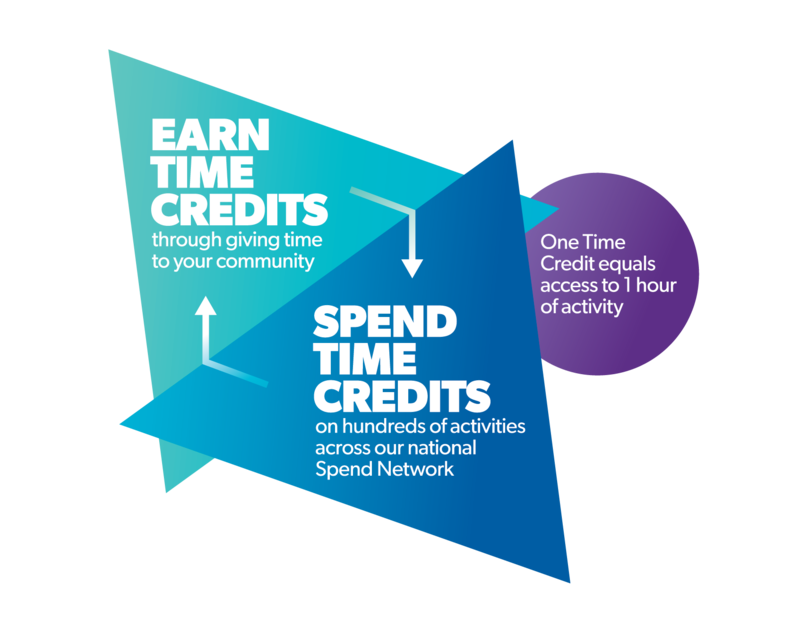 You frequently support workshop activity with members of the public, do you think this type of activity is important and why? Circus has always been a temporary moment of magic which would bring communities together to share the experience. Although the tent would get packed away and the circus would leave it would leave behind a mark and memories on a landscape. 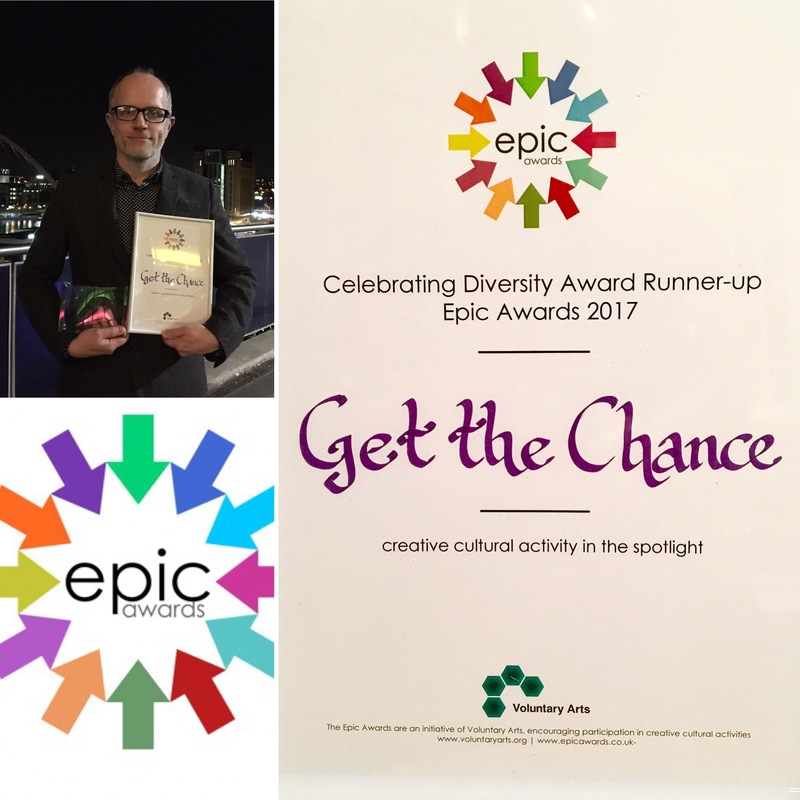 I think that re engaging with this shared creative energy which brings communities together can only be a positive thing. I love how accessible circus is. There is something for everyone. It is a joy full activity to learn with constant challenges but also many small victories along the way. To begin with it is subtly physical and great for our physical and mental wellbeing. It teaches children to support and look after each other and allows adults to connect and get stronger and fitter but through a creative medium. What are the opportunities for those interested in circus in Wales? You are lucky to live in Wales! The opportunities are vast. No Fit state run a full program of classes for adults and young people in Cardiff the community there is vibrant supportive and addictive. You can also check out the opportunities for circus in other areas of Wales. There are many established community circuses offering training in different areas around Wales. Elaine Bennett Co-founder of Penarth Circus and myself are so passionate about circus we would like to bring it to our doors steps. So we have started Circus Penarth. Over the summer we will be putting on workshops at many events and also we will be bringing some spectacular performances to Penarth Pier and other Vale of Glamorgan venues. We are hoping to start classes in Penarth over the winter. That sounds great! If you were in charge of funding the arts in Wales what would be your priorities? I would priorities bringing arts to vulnerable communities who could benefit from creativity. I think art can be used as a tool for empowerment and progress so why not channel it to communities who need this. Having gained so much from the support of NoFit State Circus I would love to see the community in Cardiff continue to develop so they can keep giving this support to other people. I would definitely prioritise keeping this community in Cardiff and finding them a permanent community space. I would make the opportunities for funding more transparent and accessible to artists who are starting out and I would put a lot of energy in to keeping artists working as artists. When you aren’t performing what do you like to do in your spare time? I like to climb mountains, paddle in the sea and watch my little boy grow up very quickly. I love playing the piano accordion and currently I enjoy spending lots of my free time on Penarth Pier. You are involved in some summer events at Penarth Pier can we know more? Yes. 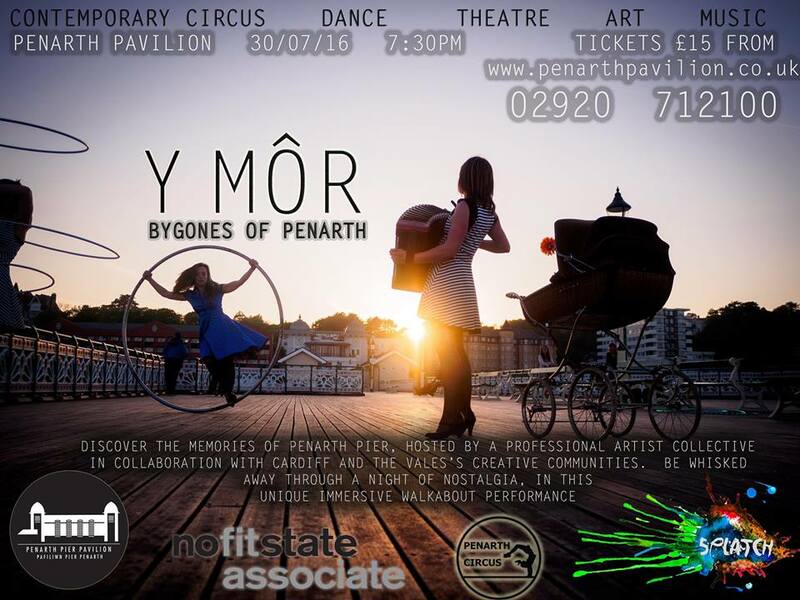 We are organising and event called Y Môr – Bygones of Penarth, It will be performed in and around Penarth Pavilion on the 30th of July. The event will involve local creative communities who will be supported by a professional cast and directed by Olga Ina Morati. We hope to bring the pier and pavilion to life in an immersive promenade performance recreating memories from Penarth pier through different points in history. Over the summer we will also be performing and facilitating workshops at different Penarth events and festivals. Every Saturday in August we will be organising different circus and theatre acts as well as street shows to perform on the pier. We will keep you updated with our performances and visiting acts on our Penarth Circus Facebook page. How do we get involved in your circus projects? 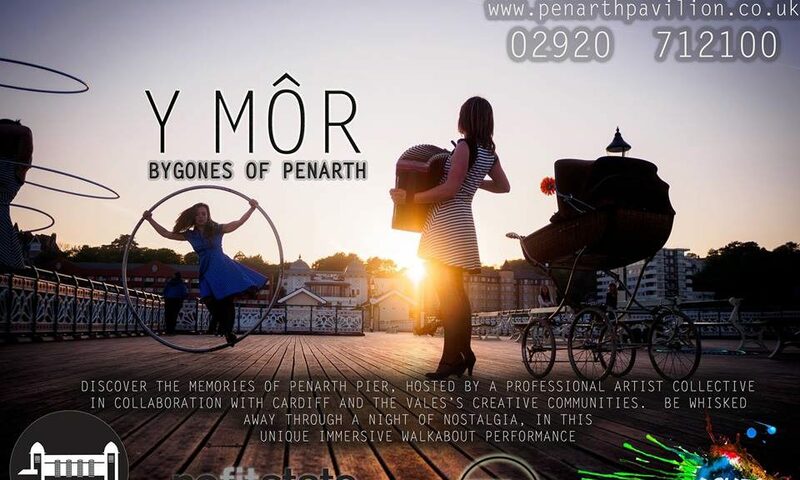 We are looking for community members who are interested in sharing their memories of Penarth Pier for Y Mor – Bygones of Penarth and also any creative individuals or groups who would like to get involved in the evenings events. If you are interested please contact us on; cardiffsplatch@gmail.com or through our Facebook page. It’s that time of year again. In the heart of Camden ladies and gentleman travel near and far as performers and audiences to see this famous name – a festival collating cabaret and burlesque performers from all across the world. For the first time ever, the festival brings a night of big bottoms but not for the first time, talent, beauty, charisma, gorgeous costumes and dazzling routines. Known for its body appreciation and acceptance and celebration of men and women alike, this themed night doesn’t seem like something new. Burlesque crowds accept the art and not the looks and celebrate all forms of people. But this night collates these curvaceous beauties and their amazing confidence. From the patriotic British routine, where we are made to salute our queen and country in the name of wiggling bottoms to a flown in New Yorker bringing us a cheeky classical routine, as always the festival brings a range of routines that make us laugh and leave us in awe. We’re transported from the 1940’s cabaret scene to a 70’s disco and each time there is excitement, there’s something new and something even more admirable than the last. Anyone can love burlesque – and I urge everyone whether into theatre, into cabaret or none of these art forms at all to see a show. There’s always something either in the theme, in the types of performers or in the choice of routine ideas – one show leaves you confident, elated and able to conquer the World. verb (used with object), closed, closing. verb (used without object), closed, closing. The word closer has so many different meanings – the list goes on. It can be negative and it can be positive. In the case of Circa’s performance of ‘Closer’, it is certainly a positive experience emanating the above definitions and some more. How much closer could one get to a small, intimate audience, only a matter of inches away from bending, flipping and tumbling bodies, inside the belly of a giant purple cow? 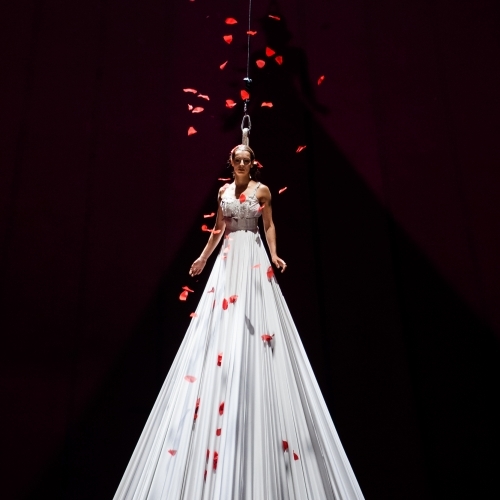 Everything about this show is the definition of Closer – the performers with their relationship, trust and confidence in one another to undertake stunts in a small area, to be close physically with one another to do death defying aerial tricks, push, pulling and throwing each other around the stage; the interaction with the audience through speech, facial expressions and involvement of a select few. Through the dangerous tricks, the rare but possible accidents and often the technical aspect of rigging and staging, it’s a new take on circus to attempt this in such a small area. Stereotypically we are used to the big tops, some branching out and bringing new takes on circus but still in large arena’s such as the astonishing ‘Bianco’ by Cardiff’s own No Fit State Circus and the occasional trapeze, hula hoop or juggling in small cabaret settings such as variety and burlesque shows. However, this is instantly something new. 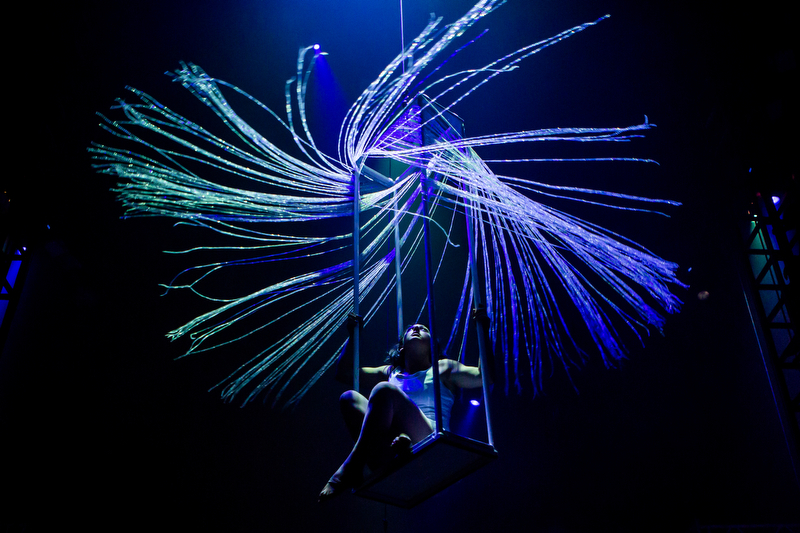 Minimalist set and rigging, the majority of the tricks performed make use of the performers bodies instead of staging and rigging. 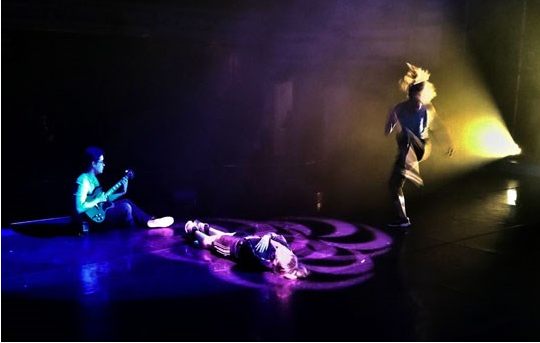 Moments that make the audience gasp in pain, when the performers look comfortable and still at ease. These performers make everything look so easy – but still, DO NOT TRY AT HOME! These awkward oddball cool kids not only give us tricks, but they give us acting. Their strange romantic yet family-like playful interaction with one another as well as with us gives us a warm feeling inside and also a little giggle. With the addition of music which is a mixture of popular songs, remixed versions and then strange instrumental combinations, these parts of the Circa puzzle gives the whole sense of a strange Parisian world where these characters are the only 5 who reside – but yet we are welcomed and included with open arms. Cringey yet fascinating and exciting tricks, air defying skills, a bit of danger, a laugh and something a little different to the ‘norm’ – what else would you want to spend your night watching? 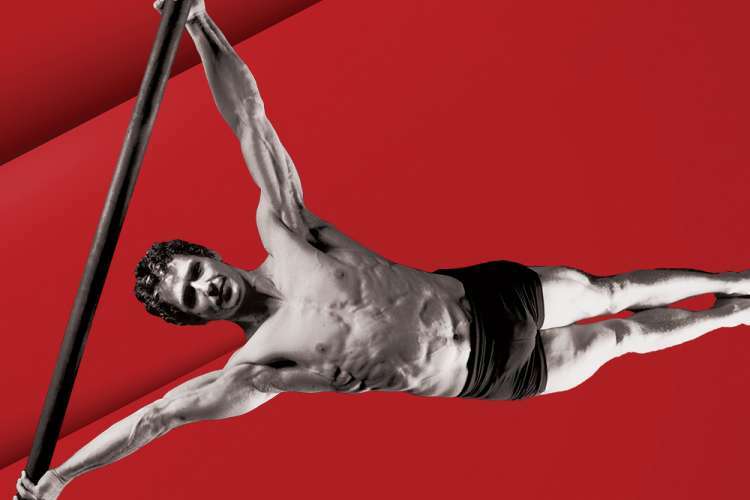 Jugglers, acrobats, gymnasts et al entertain as the audience takes their seats – latecomers miss a treat. Spectacle and excitement with dazzling displays of circus expertise – Barnum has them all. Based on the life of American showman Phineas Taylor (PT) Barnum who took his team of trapeze artists clowns, jugglers plus talented performers such as the singer Jenny Lind all over America and the major cities of the world, this is musical theatre traditional style given a new fillip by Cameron Mackintosh in this Chichester Festival Theatre production. All the elements of the original Broadway production are here, but for those who were fortunate (or are old enough!) 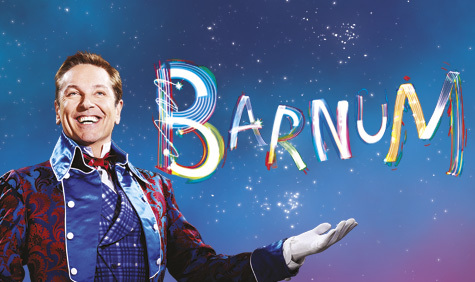 to have seen the production starring Michael Crawford which ran for a record-breaking 655 performances at the London Palladium after it opened in 1981, the big question must be: Does Brian Conley who is playing the demanding and exhausting role of showman PT Barnum live up to the almost-impossibly-high standard created by Crawford? The answer has to be: Yes! Yes! And Yes! Conley’s Barnum is a likeable con man who could charm monkeys off trees – and does. Though when he forsakes his long-suffering wife Chairy, whose views differ radically from his as to what is right and what is not, siding with him becomes momentarily difficult. Even here, how can you feel anything but gut-wrenching suspense for a man who walks a tightrope to get to the temptation awaiting him on the other side in the shape of a delectable Swedish opera singer?? Metaphorically speaking, you say? No – in a daring act which took weeks to perfect, Conley actually does walk the tightrope. Indeed, throughout the show, along with the rest of the cast, he runs the gamut of acrobatic and dance skills with aplomb and style. The bubbly Linzi Hateley more than holds her own as Chairy, the wife who despite brooking none of her circus-loving hubby’s nonsense, remains true to him till the end. The story of their marriage, with all its ups and downs, runs in perfect tandem with the on-going razzmatazz of the show, peppered with songs such as the foot-tapping ‘Come Follow the Band’ which opens Act I and Barnum’s theme song of ‘There Is A Sucker Born Ev’ry Minute’ plus the poignancy of ‘The Colors of My Life’ sung with feeling by Conley and Hateley, as is ‘So Little Time’ later, in Act II. If there is a criticism to be made – and in such a polished production it seems almost invidious to do so – it is that Kimberly Blake as opera star Jenny Lind, while looking stunning and ethereal in an ice blue creation that would not look out of place at the Oscars, is a tad too ethereal. The lack of chemistry between her and Barnum renders their love affair not entirely believable – a minor hiccup in an otherwise five star production. 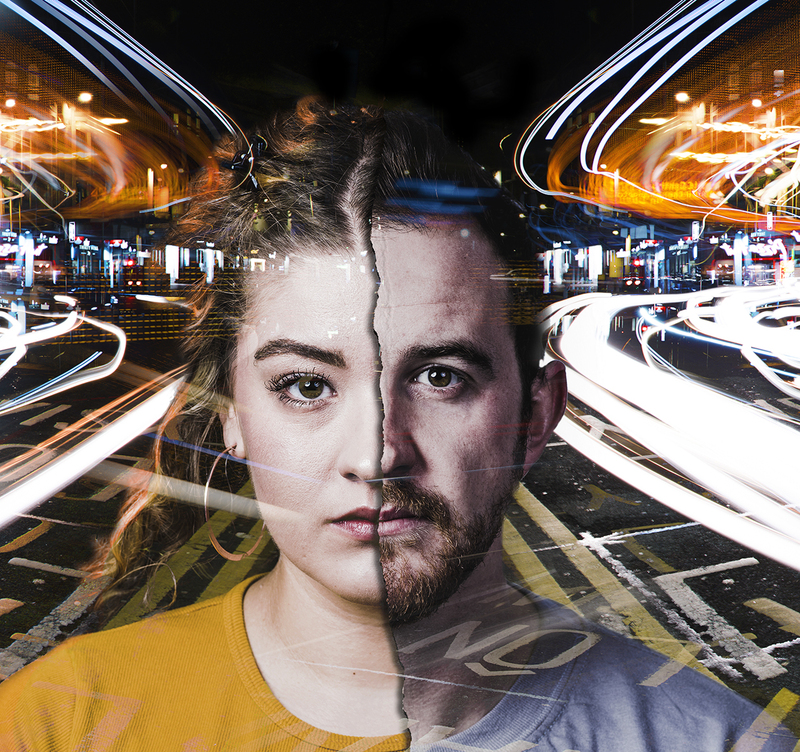 A considerable chunk of credit for the fizzing excitement that characterises this high-energy show must go to the ensemble. On stage for most of the time, the acrobats, trapeze artistes, high wire experts and dancers never flag. Some neat cameo roles, too, from David Birch as an anxiety-ridden Wilton, while Edward Wade’s Julius Goldschmidt is a gem. With great costumes and breath-taking staging – including a mock-up of the nether limbs of an elephant – this show is a firecracker. 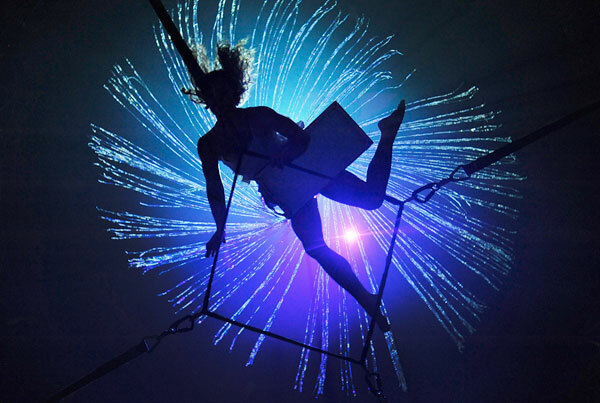 Nofit State Circus is back with its newly adapted 2015 immersive promenade experience BIANCO. Entering the tent you are left to explore a huge dimly lit grunge style performance space. As the artists gabble away to each other, pushing through the crowd as if obstacles, the pre-show is choreographed chaos with silhouettes of performers, hidden by translucent sheets, warming up behind a scaffolding cage in front of you. Props and ladders are thrown around amongst muffled shouts of indistinct languages and you stand there invisible, as if you have secretly stumbled into an unidentifiable time. Channelling Portuguese laureate José Saramango’s novel The Elelphant’s Journey, embarking on an adventure across Europe, creator and director Firenza Guidi’s BIANCO plays with concepts of geographical place and contemporary culture. With a cast from all over the world, the show incorporates elements of burlesque humour, romance and cabaret set against innovative contemporary imitations of a trip to the cinema and a balmy trampoline based scene at the seaside. Between the tender moments of interpretative sequences in the air by the trapeze, rope and silk artists, there are dives and stunts that generate gasps from the audience as performers drop, spin and leap above and around you but the element of danger makes it all the more exhilarating. Whilst the team are incredibly safety conscious with the audience, particularly the children, the company perform without safety nets. However, their energy and confidence is infectious and within the first fifteen minutes, you begin to forget that they are in danger at all as you are so wrapped up in the visual and aural spectacle. Scene changes often become a part of the act and there is always something to overt your eye and capture your attention whist structural reshuffles are taking place. There are a few stagnant changes but the momentum is never lost as the atmosphere is maintained by the incredible live band and diverse score. BIANCO is as much about the artistic choreography as it about the music that compliments it. Shedding their clothes, transforming and adapting to each new structure, the chameleon like performers take on multiple roles within this huge narrative and create a visual language that demonstrates (building on the foundations of Saramango’s novel) that we are capable of surpassing our own expectations. To single out individuals feels wrong as every performer whether they are holding an instrument, strapped to a harness or doing both adds something unique. You cannot merely watch the show, for those extensive 140 minutes you become a part of it, being allowed to enter the performers intimate world both figuratively and literally through the promenade experience. If you are willing to embrace BIANCO for what it is – there is no pandering to the audience, you are shuffled around and you stand for the duration – the danger, spectacle and unrestrained beauty will take your breath away. The technical skill and serenity is coupled with something raw but the outcome is utterly compelling. 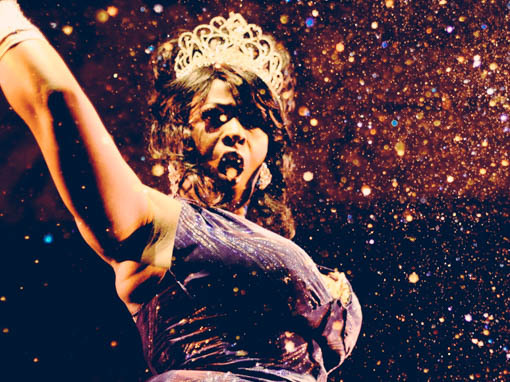 Nofit State Circus bares its soul in this pioneering production of friendship and adventure. It is clear that a NoFit family has been created and by end of show when in that moment you want to be a part of it, you find yourself left in the finale’s close standing in a snow globe with the performers watching you. NoFit State don’t just set the bar high, they fearlessly leap over it. 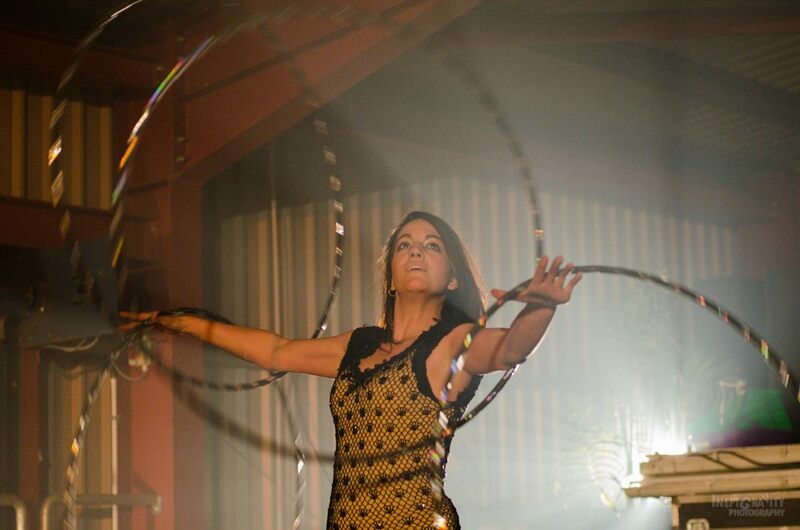 Inside the European Spiegeltent on London’s Southbank, a new world is formed. This cabaret, fringe style hub hosts a huge supply of performances to see, all different and all spectacular. London Wonderground introduced me to the Briefs – a circus, cabaret, boylesque drag show from Australia. As a fan of all these types of performances, I thought I would know what I was heading for, but in reality, I could not have ever guessed ! We were introduced to a host who not only welcomed you to their show, in a friendly and personal manner but also cracked many a joke and innuendo that could only be described as side splitting. Her costumes were ever changing and lived up to the notoriety of drag acts for being stunningly beautiful – from her costume, to her make up, to her on stage persona. Not one group of performers has ever had so many skills and used them so well together in such a polished show. Dallas DellaForce brought her stunning change of drag acts, lip syncing and changing her personality from a Cher lookalike, to a posh dog owner, to even a boylesque balloon act with a split personality syndrome. Her beauty, charm and fantastic acting skills won over every audience member. Acts such as a young gentleman able to complete a rubik’s cube in little more than 3 minutes while dressed as a cheeky school boy made everyone astonished and giggle. His skill in as little as yo-yo tricks, while talking about it here may seem tedious, but was in fact awe-inspiring, linking this into a burlesque routine, also divided the audience from the strong to the prude, releasing the naughty but rude nature of the show. This continued with acts such as a crazed and clown-like monkey character, who used innuendos and phallic inspired jokes to ensure that this show was not for the faint hearted, but definitely for those with a great sense of humour. Of course, this wasn’t always the aim of the show. Adult content always ticks a box for me in shows such as this, but moments of sheer awe not only gives a break for those who feel a little shocked, but to also gives a moment for your jaw to drop. A flexible and strong male who was able to contort himself, fly high above us in a hoop performing tricks that you could only wish to do left the room in silence, with the occasional ovation and cheer for the fantastic tricks he was able to do. Finally, to end the show, a fantastic burlesque act. Beginning in an outfit to die for as a beautiful bird of paradise, ending up in a Dita Von Tease style champagne glass of water, and again, a series of acrobatics movements above us, this act was not only verged classic and elegant, but comedic with water splashing everywhere, drenching the poor premium Wondergound seating areas at the front. Who could ever be mad at water-soaked performance when it was executed so perfectly and gracefully! Bianco’, performed by ‘No Fit State Circus’ was the last show I went to see at the Edinburgh Fringe Festival. I left the circus tent shaking in awe. When a performance has given you a lump in your throat that makes it hard to even cheer or clap, you know they have done well. Every section beautifully designed that was enhanced by the power of the live band. There were no individual stars but an ensemble of talented performers, each bringing their own expertise to the stage. Even though this was a stereotypical contemporary circus show, they brought so much emotion to the way they performed that it stood out from any other circus acts. The music and the lyrics especially helped create this emotion and made mini-narratives for each section. There were moments in this show where I felt I’d left reality behind and stepped into a dream. It was aesthetically pleasing in every sense that I couldn’t believe it was happening before me. I never wanted it end. What was more interesting is that I felt like I was part of the production myself. The constant change of positions to re-arrange the performance space made it become even more immersive. Sometimes it took away from the essence of fantasy, yet it was necessary. It was evident that every aspect of the show was well thought out and infused with professionalism. Every person so physically fit it was inspiring to watch. Overall ‘No Fit State Circus’ is heightened with pure talent, innovative imagery and a set to be admired at. Step into this tent and leave reality behind. Cardiff Comedy festival has brought many opportunities for a belly laugh over the last few weeks. Being invited to watch comical plays by South London group, Velvet Trumpet was a great opportunity and just what I needed today. Toast began with us looking at a simple dining room table with all the pieces to the puzzle for Toast eating. What made this short skit special was that the toaster was fully functioning, filling the room with the smell of warm bread and the steam against the simple whitewash lighting. We are introduced to Michael; the usual man, making his breakfast and getting ready for work. His love affair with toast is something that most can relate to. The gluten and wheat intolerant in me could even relate to the versatility and ease of toast eating in a previous time. However toast is only a metaphor for Michael’s failed marriage and his way of coping. Hilariously taken through his story, his take on his ex-wife and his life provided many opportunities for a laugh. Interaction with the audience, bringing one on stage also made us feel hilariously awkward, such as the story at that point in time tried to express and the uneasiness of this made the audience laugh continuously. The actor playing Michael managed comedy in an almost natural way in this story telling style, without trying to bring slapstick into the performance which could have been an easy way out; so when the story turns a strange journey, this provided more comical outlets for the absurdity. A short ten minute break and the change from the original minimalist staging and props turned into an even more simple projection. This longer piece began with a short video of Ken and Steve and their travel of 200 miles from London to Swansea, all in the name of art. However, the support of the Welsh for these two Swansea Jack’s were severely lacking, and during their ‘presentation’ Ken’s anger comes alive. This, what seemed slightly unscripted, piece was a complete turn on the night so far. A simple piece focussing mainly on the telling of a story had turned into the back and forth relationship between Steve – an average and calm man and Ken – a melodrama-ed version of a proud Welshman. More audience interaction, multimedia usage and plenty of slapstick, it was hard to not laugh. Since the actor of Ken was played by the same man as Michael in Toast, himself as a performer was really interesting to watch to show his versatility as a performer; from a naturalist story-teller to a complete over exaggerated being. 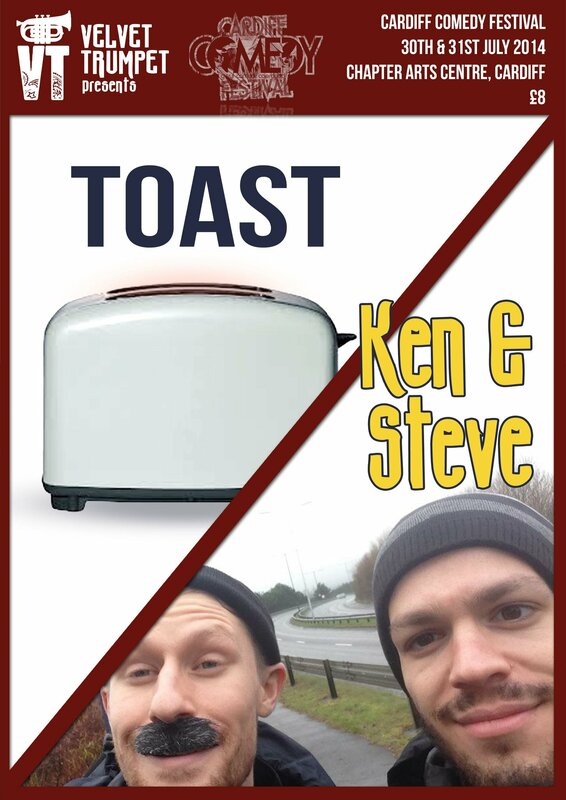 Ken and Steve picked up many part of Welsh comedy, looking at stereotypes of the Welsh and of particular places in both their telling of their journey, their quips and characters themselves. Combined with high energy movement at times and use of film, this simple but effective piece was a great ending to the night. Velvet Trumpet had combined the two pieces well by beginning with something so calm and ending with something so solidly humorous – this company sure know how to get their audience and how to combine two different forms of comedy for a fantastic night.